On November 25th, 2013 I published a knitting pattern titled Hans my Hedgehog. It's a simple pattern which has become fairly popular; the page where it's posted on my blog receives approx. 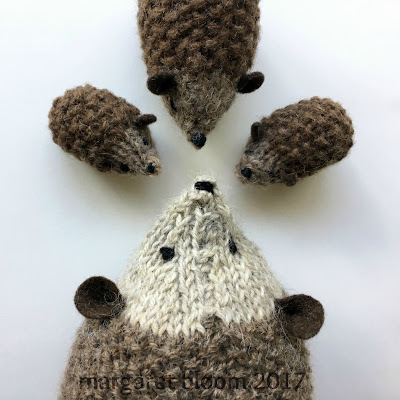 100 views every day, and I love looking at photos of completed projects over on Ravelry (each little hedgehog has such unique character). The pattern has been used by the Wildlife Trust, UK to promote the need for environmental conservation on behalf of local hedgehog populations, and people have also used the pattern to create key-chains, luggage tags, cat toys stuffed with catnip, Christmas decorations, and in classrooms/libraries as a character to dramatize The Hat, The Mitten, and The Bear's Winter House. It's also been translated into French and Hebrew! 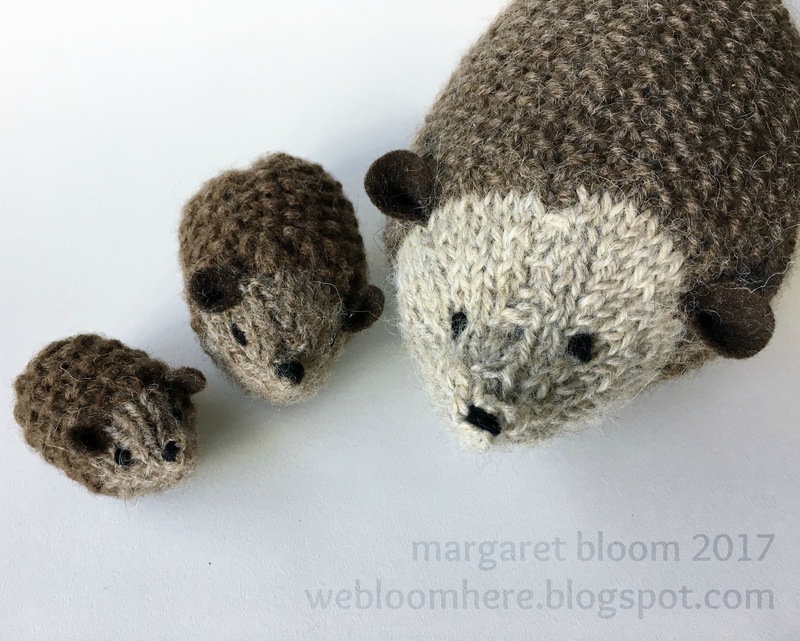 Every so often I get emails asking whether I might consider creating a pattern for larger hedgehogs. I had hoped to fulfill this wish for my readers this past autumn so holiday gift making could ensue. However, now that it's January, you have 11 months to get started on gifts for next December (or you could make Valentine gifts... that would be nice, too). For this project you will need two shades of earth-tone, worsted weight yarn. 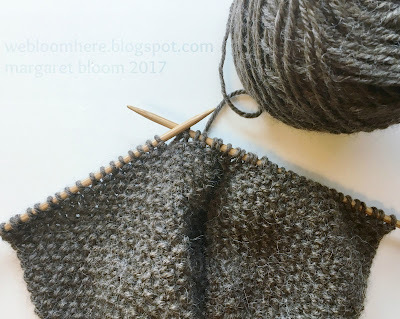 I used Berroco Ultra Alpaca in Buckwheat (6204) and Barley (62189). 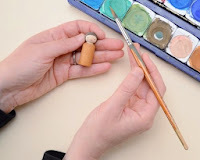 Additionally, you will need a tapestry needle, a small scrap of brown wool felt for ears plus 1/2 yard black worsted yarn for embroidering the eyes & nose. Black beads would work nicely for eyes, too. 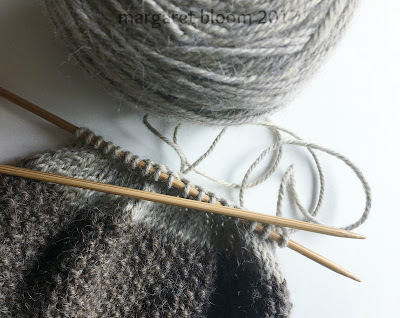 I used size US 5 (3.75 mm) needles, which is smaller than this yarn would normally require. 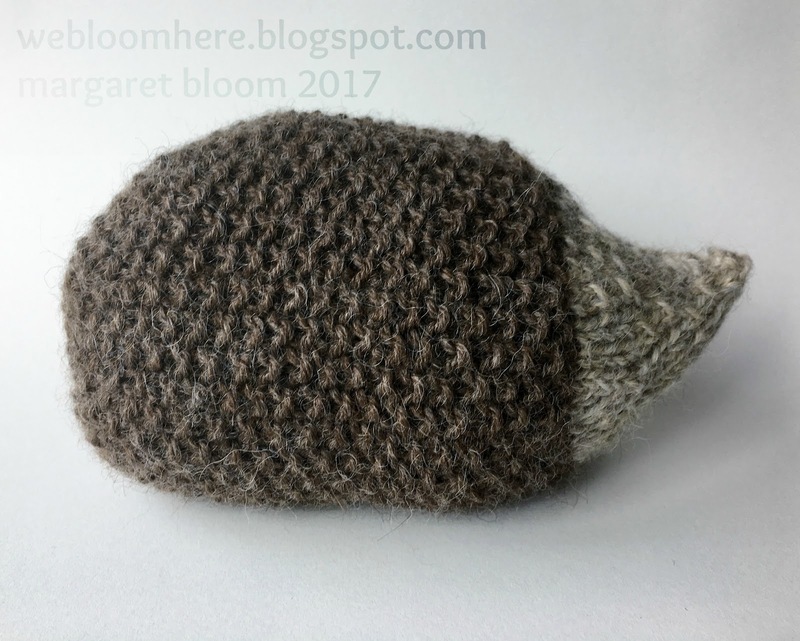 You can see here that I like to knit tiny animals using small needles -- it keeps my stitches tight so the stuffing doesn't peek through. 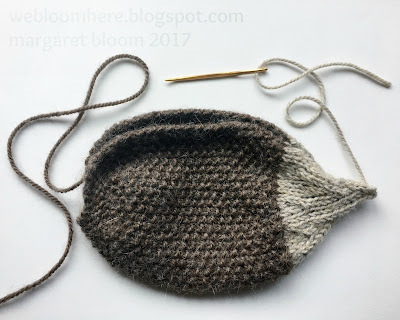 And I don't enjoy knitting in the round with DPNS, so this pattern is knit flat then seamed up at the end, but you are welcome to adjust my pattern for DPNS if you prefer. Seed (or Moss) Stitch: Work rows as follows: (k1, p1), repeat to end. On the next row, you will continue the pattern of (k1, p1) always making sure to knit into the purl stitches and purl into the knit stitches. After being stuffed, my large hedgehog turned out 9 inches (23 cm) long from nose-end to tail-end. Switch to lighter yarn color. Cut yarn and thread the end into a tapestry needle. Run your needle through remaining stitches and pull tight. 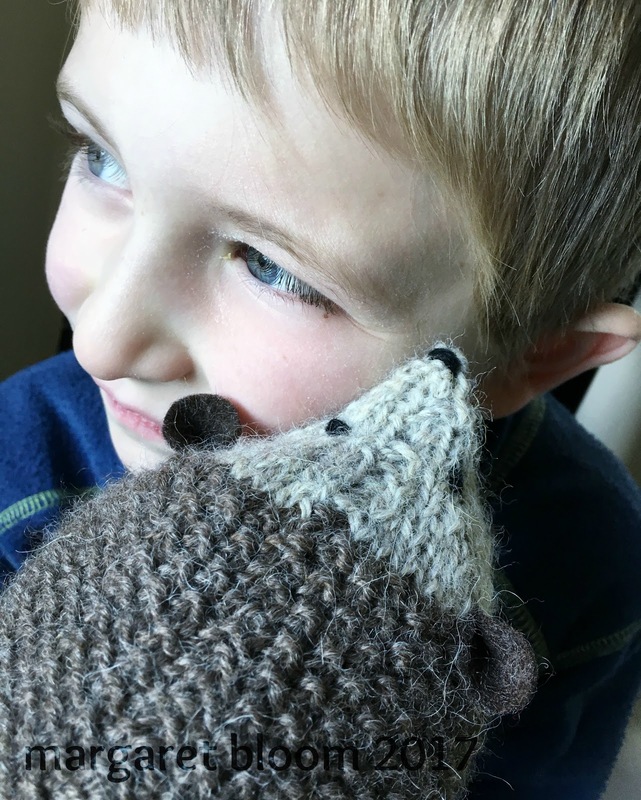 Use tail end of yarn to seam closed front/face portion of the hedgehog and knot off or weave in end. Use yarn tail where color was joined to sew up body portion of hedgehog. *Be sure not to sew up CO edge. * Knot off or weave in end. Note: I used an overcast stitch (and did a rather untidy job – I’m sure you will do better). You could also use an invisible/mattress stitch. 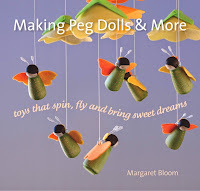 Instructions for stitching can be found here. Lightly stuff the hedgehog through opening along CO edge, then thread a tapestry needle with tail from CO. Create a running stitch along CO edge, pull tight and knot end to secure. 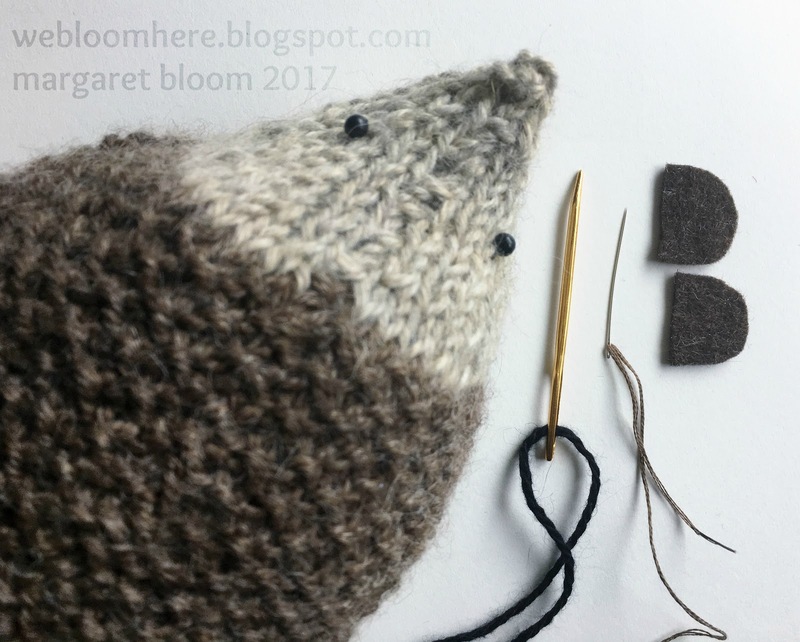 If you would like the nose on your hedgehog to turn up, position your hedgehog so that the seam is along the top (i.e. running along the back of your hedgehog – not on the underside). Use black yarn to embroider eyes & nose (you can use black ball-head pins to help with eye placement). 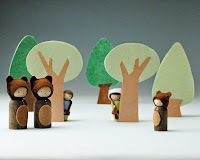 Cut ears from brown felt and sew on with thread, or you can add knitted ears. 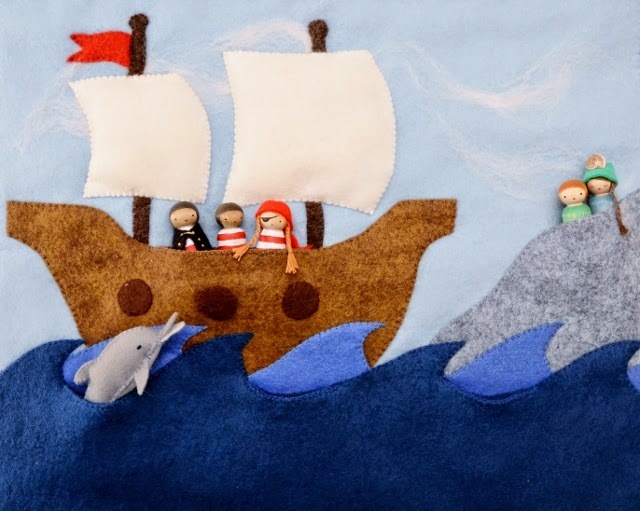 If you enjoyed this project, I hope you will post photos of your own work on the Ravelry page here. So cute Margaret. I especially love the picture of your son with him. Just wish I could knit. Oh, I think the baby hedgehogs are going to be getting a big brother one of these days!! !